Although solar electricity producing devices have been around for over 50 years, solar electricity devices, often referred to as photovoltaics or PV, are still considered cutting edge technology. The promise of clean, cheap, and abundant electricity from the sun has been the dream of many scientists and businesses. As a result each year a number of discoveries and advances for this technology have been made. 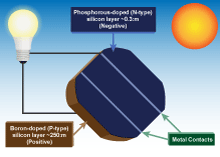 This primer has been designed to cover some of the basic concepts, components, and uses of PV. Explore each of the sections below to begin your enlightening journey. Since the earliest PV cell created at Bell Labs, the technology has come a long way. Read this section to get a look at what types of PV technology are available today. Since its recognized beginning at Bell Labs over 50 years ago, each year has brought a number of important discoveries to this technology. Explore this section to review the history of this important technology. Though they have "no moving parts" PV cells are very complex devices. Here we look at how light from the sun it used to generate electricity. At the heart of any PV system is the PV cell. From there, cells are connected together into modules and those modules are connected into arrays. This section explores how the various components described are connected together. In order to power large systems using PV like buildings, PV panels are connected to other electricity management and storage devices such as batteries. We'll explore what the roles of these components are. 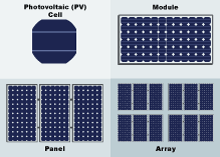 There are a variety of ways that PV systems can be designed. This section explores some of the more common configurations of PV systems. In a similar way that computer chips are made, the PV cells are built in very carefully constructed machines and factories. We'll look at what it takes to make these amazing devices. The hope of very cheap yet useful PV cells made with thin-film techniques is one the of most researched and fastest growing areas of PV. Take a look at this section to learn more. PV holds the promise of being the solution to many of our energy needs but it's not suited to all tasks. We'll explore some of the advantages and disadvantages of PV. There's always new words and terminology that is used to describe new technologies; solar electricity is no exception. Lookup this section to better understand some of the terms used by this primer.